Bacteria are the simplest, the smallest, and the most successful microorganisms. They were first discovered by Anton Leeuwenhoek (1676). In the five kingdom classification, they are placed in Kingdom Monera. Bacteria reproduce by Vegetative, asexual and sexual methods. In this case, a small protuberance, called bud, develops at one end of the cell. Genome replication follows, and one copy of the genome gets into the bud. Then the bud enlarges, eventually become a daughter cell and finally gets separated from the parent cell. Mostly during unfavorable conditions, bacterial protoplasm undergoes compartmentalization and subsequent fragmentation, forming minute bodies called gonidia. Under favorable conditions, each gonidium grows to a new bacterium. It becomes apparent that prior to fragmentation the bacterial genome has to undergo repeated replication so that each fragment gets a copy of it. It is the commonest type of reproduction under favorable conditions in which cell divides into two similar daughter cells. During the process, the bacterial chromosomes get attached to the cell membrane and replicates to the bacterial chromosomes. As the cell enlarges the daughter chromosomes gets separated. 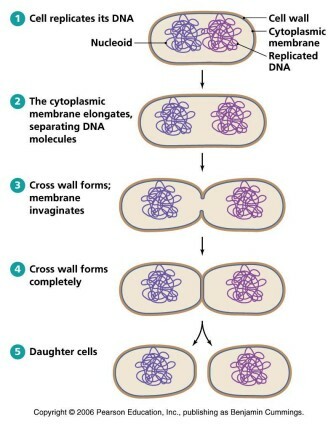 A cross wall is formed between the separating daughter chromosomes. It divides the cell into two daughter cells. The daughter cells soon grow to maturity within 20-30 minutes. Under favorable conditions many bacteria divide once in 20-30 minutes. takes place by endospore formation, conidia and zoo spores. 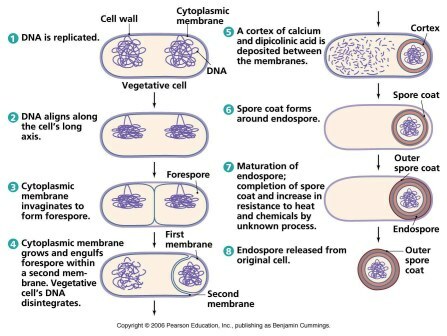 Endospore formation: Endospore are resting spores formed in some gram positive bacteria (Bacillus and Clostridium) during unfavourable conditions. They are formed within the cells. During this process a part of the protoplast becomes concentrated around the chromosome. A hard resistant wall is secreted around it. The rest of the bacterial cell degenerates; Endospore are very resistant to extreme physical conditions and chemicals. During favourable conditions the spore wall gets ruptured and the protoplasmic mass gives rise to a new bacterium. Sexual reproduction occurs in the form of genetic recombination. There are three main methods of Genetic Recombination: Transformation, Transduction and Conjugation.